Mae Nam Kong Grand View Hotel, 527 Soonthornvijitra Rd, ☎ +66 42 51 356 470. 112 rooms. 600-1,500 baht, but discounts abound. Nakhon Phanom River View Hotel, 9 Nakhon Phanom Thatphanom Rd, ☎ +66 42 522 333, . 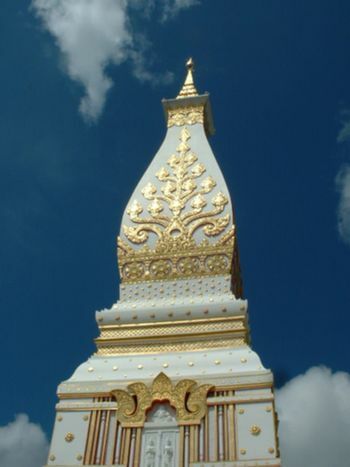 Located in the Muang district of Nakhon Phanom on Nakhon Phanom-That Phanom Road. It consists of 122 rooms in four types: suite, river view, superior and standard. All rooms are equipped with air conditioning, hot water, shower, TV with international channels, minibar, safe deposit box and more. There is a restaurant, meeting rooms, swimming pool, and bar on the property as well. 1,050- 10,500 baht. Windsor Hotel, 272 Bamrung Muang Rd, ☎ +66 42 511 946. This 5 storey hotel is very dated but quite clean,with hot water in the shower, air-con, TV, bar fridge, and a lift. Coffee is free in the lobby in the mornings. It is situated about 300 m from the river and will cost 40 baht by tuk-tuk from the bus station. Pricing is confusing as they call a twin room a "double" (because there are two beds there) and a "single" is what we call a double because there is one (double) bed in it. Little English is spoken, depending on who is at the counter. But they are very friendly and helpful. twin, 400 baht, double is 350 baht. Fan rooms, 250 baht..
Srithep Hotel, 197 Srithep Rd (Follow the main road from the bus station for about 2km in direction to the Mekong. The hotel is a big white outdated looking building on the rigth side.). Basically the same as Windsor Hotel, but with bigger and better rates for two people. English is somewhat spoken, but this also depends on who is working. double (two beds) fan/AC 300/400 bath (June 2015).